BORN: December 25, 1945, Piedras Negras, Mexico. EDUCATION: Walked across the U.S. border daily to attend high school in Eagle Pass, Tex. Three years after starting to learn English, he graduated as valedictorian. Earned a B.S. in electrical engineering from the University of Texas at Austin in 1968 and a PhD from Rice University in 1972. CAREER: Six years at Texas Instruments and 22 at Motorola, overseeing worldwide manufacturing, worldwide research and development, paging, and semiconductors. Since February, 2000, has been president and COO of Advanced Micro Devices. VISION FOR AMD: The 31-year-old company has never been more successful thanks to its inexpensive Athlon microprocessor. Ruiz plans to expand production capacity and move into the high end of the PC biz. BIGGEST SURPRISE IN NEW JOB: How rough rival Intel plays. Ruiz says he's ''shocked'' by some of the chip giant's hardball tactics, such as pressuring customers not to buy from AMD. Intel denies wrongdoing. WORST PROFESSIONAL EXPERIENCE: Overhauling Motorola's semiconductor unit in 1997, including cutting 21,000 jobs and moving the headquarters from Phoenix to Austin. Got threatening letters from employees. The moves returned Motorola to growth. BIGGEST LIFE INFLUENCE: Methodist missionary Olive Givin hired 15-year-old Ruiz to help around the house in exchange for English lessons, urged him to attend U.S. high school, then paid for his first year of college. Ruiz dedicated his PhD dissertation to her. CULTURAL IDENTITY: Became a U.S. citizen in 1975 and identifies himself as a Texan. Still prefers Mexican food--especially rich mole sauce. Elected this year to the U.S. Hispanic Engineers Hall of Fame. Speaks frequently to business and youth groups to encourage Hispanics to enter engineering. PERSONAL VALUES: Having experienced discrimination, Ruiz aims to ''treat people with the utmost dignity.'' His leadership style is tough but respectful. FAMILY: Widowed at 29. Married wife Judy 24 years ago. Son, Hector, now 28, from his first marriage, and Judy's two children, Joanie, 35, and Greg, 28. "Hector turned out to be a sleeping giant. No one expected this guy to be as managerially savvy as he turned out to be," said Rick Whittington, an analyst with Caris & Co. "All the detractors said they would never get this far." "The pricing environment will continue to be challenged because we're not backing off. The strategy of our competition is to get us to blink, and we're not going to. We're going to fight for every piece of business that we can, and we're very much emboldened and will hang in there. We ended up in 2006 at the highest market share in the history of our company, in the mid-20s, and we intend to fight like crazy to retain it"
"As the first fruit of AMD-ATI joint effort he mentioned the previously announced Fusion technology which represented a new type of computer microprocessors combining a CPU and a GPU in one chip. He also said that AMD would not prevent other graphics chipmakers from developing products for its platforms. ‘We are hoping and encouraging Nvidia to continue to develop products because we will not artificially prevent them from participating in our ecosystem’, he said"
"This week's announcement with IBM may well turn out to be as significant as IBM's original decision to develop an Opteron-based server in 2003. Despite the early promise of that partnership, IBM initially only produced a single Opteron based machine, focusing instead on Intel processors. 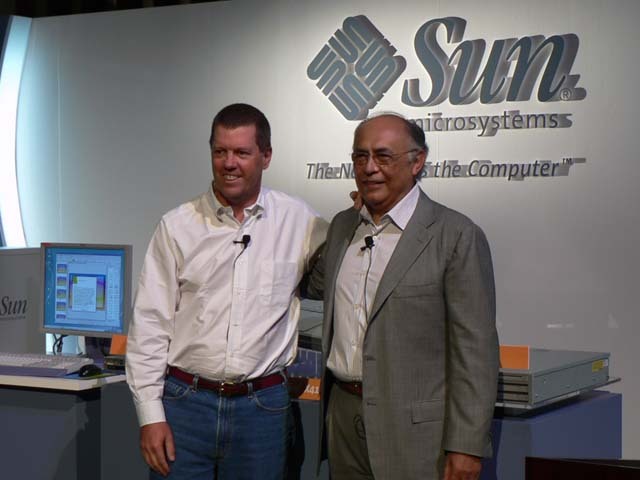 The deal's symbolic importance outweighed the number of IBM products on the market.."
"Motorola and AMD had a joint development program, which brought Ruiz to the attention of AMD founder Jerry Sanders, who recruited Ruiz in 2000 to be president and chief operating officer. 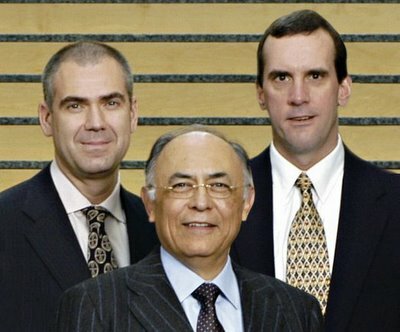 When Sanders retired as chief executive in 2002, Ruiz took the top job. 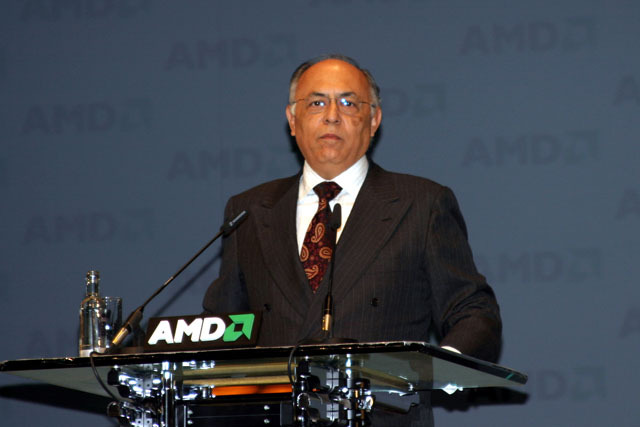 He became chairman in 2004"
"Enderle likes the new discipline Ruiz has brought to AMD. "He's really getting the financials and operations in good order and making strong management and organizational decisions, as opposed to going after every opportunity on the planet," says Enderle, citing the spin-off of the flash memory unit into a joint venture with Fujitsu called Spansion. "Those decisions are very hard to make, because a lot of folks only want to acquire companies, and the end result is a complex mess that can't be managed."" "It does two things for us. One, it allows us to have the technology roadmap in place to go down the technology evolution of [manufacturing with line widths of] 65 nanometers to 42 nanometers to 32 nanometers, which we really didn't have before. And it gives us a huge boost in capacity." 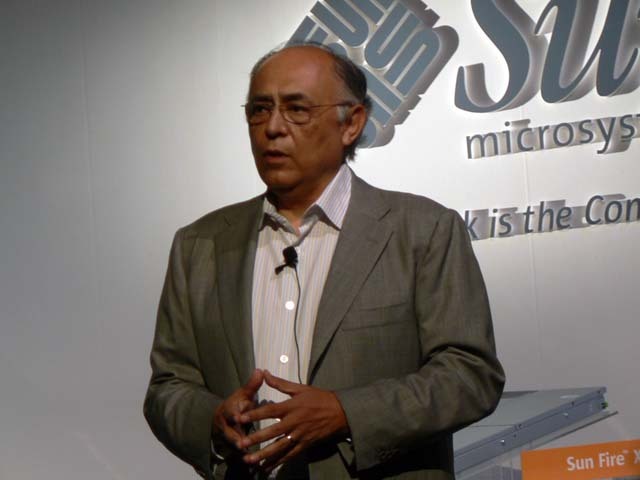 "Hector Ruiz, chairman, president and CEO of chipmaker Advanced Micro Devices Inc., is among the country's most influential Latinos, African-Americans and Asian-Americans in business, sports, politics, academia and the arts, according to Fortune magazine. " "The PIC was our first attempt to do something different. I think that will continue to morph into a new generation of products. We have a PIC2 and a PIC3 on the roadmap. All those products will improve the (computing) power and value, while at the same time lowering the cost." "Intel is strong company and very capable. We just think this requires a lot more than a desire to do it. I don't know if you can retain their existing bus architecture and change it enough to get the level of performance and value that we have. If they change the architecture, that is not a trivial thing, so it will take them longer. And customers are already making an investment in the enterprise and are not just tip-toeing in the water. " "The initial design of Turion 64 platform is for notebooks, but as the product matures, we will also develop similar versions for entry-level consumer products, high-end devices for enterprise users and workstations." "You know, two years ago there was no 64 bits anywhere in the enterprise. Nothing at all. And we've gone in two years to where Tier 1 manufacturers, such as IBM, Sun and HP, and others, have signed up. I don't think there's any question in anybody's mind that the enterprise from an OEM perspective is moving and offering great products, and that's only going to accelerate. " "He said that once AMD has the dual core capability into the Opteron in the second half of next year, the marketplace will decide what consumers want in their performance machines. If customers decide they want that, AMD will consider doing it, but the most logical way is not necessarily to use dual core Opteron technology. On the server side it’s an absolute must, Ruiz said." "What you call a second tier, channel, system integrators--today they make up a huge portion of our business. In terms relative to our competitor, they make up a bigger portion of our business. So they are a very precious part of our business. We pay a lot of attention to it. We have a team that's totally dedicated [to the channel]. I would say roughly half of our sales and marketing effort is devoted to supporting this segment. So, by definition, I spend a significant amount of time making sure we continue to nurture and support this very important segment." AMD announced that AMD president and chief executive officer Hector Ruiz was appointed chairman of the board following its annual stockholders meeting. AMD co-founder and former chairman of the board W.J. Sanders III was elected a director and appointed chairman emeritus in honor of his three decades of leadership. Mr. Sanders also advised his colleagues that he was retiring from the Board of Directors. Advanced Micro Devices Inc. said it paid Chief Executive Hector Ruiz $950,000 in salary last year. Ruiz, who is also chairman-elect, received 375,000 stock options in 2003, down from the 1.2 million options he received in 2002, when his salary was 6 percent lower at $896,945, and he had just been named to the position. The options, which vest over three years, were granted in three tranches. Ruiz has $2.67 million worth of unexercisable stock options. 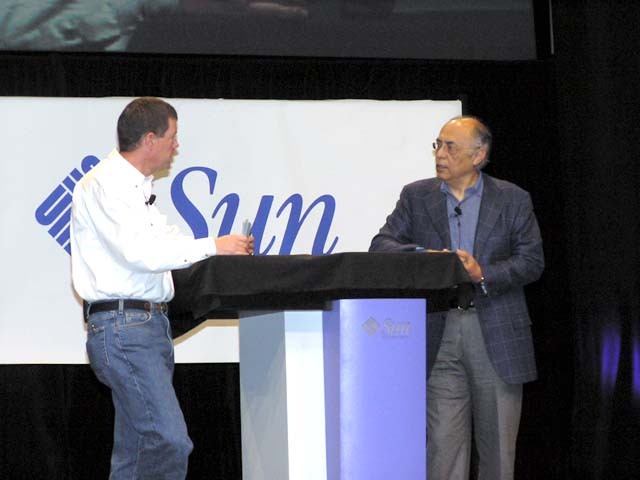 "When Hector Ruiz became CEO in April of 2002, he faced an extremely challenging semiconductor industry environment. The actions and initiatives undertaken during his tenure have returned AMD to profitable growth while positioning us for leadership in all the industry sectors where we participate," said W. J. Sanders III, founder and Chairman of AMD. "Hector embodies the customer-focused values and unwavering commitment to free and open competition which define the culture of AMD. Under his leadership and vision, and with the full support of his colleagues on the board, I believe he is ideally suited to take AMD to the next level." "The Microsoft support has been outstanding. Microsoft has just been totally committed to helping this technology become a reality sooner rather than later. 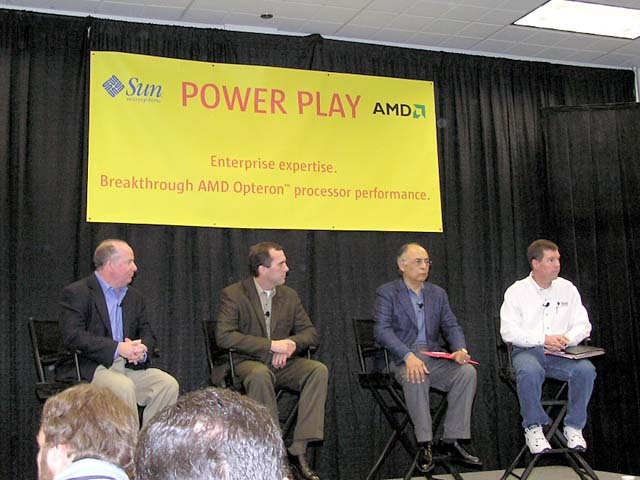 As a matter of fact a lot of their products they envisioned for their hardware side both for Opteron and Athlon 64 they've been looking at how to move them up and accelerate them"
"In his speech Wednesday, Ruiz echoed remarks made the day before by Dell President Kevin Rollins, even though Dell does not use AMD chips. Their companies appear to agree that despite the computer industry's maturity, it will continue to turn out innovative products. That's because PC makers have access to a wide range of standard components, from which they can build high-performance computers, both company chiefs said." "When Hector Ruiz, the chief executive of Advanced Micro Devices, was a young graduate student at Rice University in Houston in the 1960s, he used to hide from the school's Latino groundskeepers. Ruiz, who grew up in a border town in Mexico, was one of only two Latino students at the school and did not want to flaunt his status in front of the blue-collar workers." "AMD today announced that Hector Ruiz, president and chief executive officer of AMD, has been appointed by President George W. Bush to serve as a member of the President’s National Security Telecommunications Advisory Committee (NSTAC). " "There is no doubt that the sweet spot of the market is the volume server market—2P servers that need to be upgraded, etcetera. Many customers are looking at it. In another two months, some of the names and faces might have changed. There is a timing issue. From day one, this is a Xeon competitor. There is a good chance in another quarter or two that you will see more evidence that mainstream servers are interested in Opteron"
"His total compensation for the year topped $1.3 million, including what the company said was a payment of just more than $315,000 to cover a tax penalty related to a retirement account Ruiz forfeited when he left Motorola Inc"
"We have these people in the middle that are responsible for delivering to the enterprise the boxes. And these people in the middle frankly are, and I'll just be totally blunt with you, they're scared to death to respond to the enterprise positively of AMD for fear of retaliation by Intel. It's just as simple as that. I could give you numerous examples of enterprise people who say they would love to see boxes with AMD products in them"
"Slash and Ruiz were joined on stage by Gibson Guitar CEO Henry Juszkiewicz, who played the world’s first digital guitar. It features a "hexaphonic" pick-up that transfers the analog sounds of the strings to a digital format. The signal is then moved via Ethernet to an AMD Athlon 64-bit digital audio workstation (DAW), where it can be amplified, modified or blended with other musical instruments. The technology will allow musicians to collaborate and jam with others even if they’re in different cities around the world"
"Although it’s always difficult to predict the next big thing, from the feedback we’re getting, it’s pretty clear that connectivity is a huge issue"
"Ruiz now owns a million shares in his own company but bought 24,000 shares in AMD in early August at a price of between $7.39 and $7.90."